For students who are not located in the Gainesville, FL area, you can request a Gator 1 Card online and have it mailed to you. 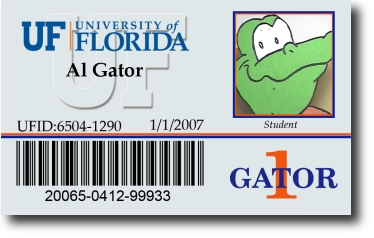 You must have a valid UFID number and Gatorlink username and password to request a Gator 1 Card remotely. The photo should be a head shot, facing the direction of the camera. Avoid photos with a "busy" or complicated background. A photo against a solid color or plain surface is best. Do not submit photos that feature you wearing sunglasses, hats, or other garments. The cost of the Gator 1 Card is $15.00, plus a $5.00 shipping and handling fee. Begin your application for a Distance Learning Gator 1 Card.